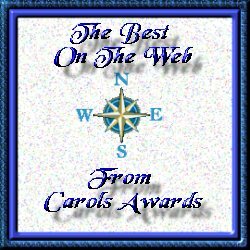 The Best On The Web Award from Carol's Awards was bestowed on this site on February 5, 2002. The award is given for excellence in website design. The Lefas Humanity Award was awarded to this site on February 08, 2002. The award was bestowed for excellence in web site design. "Your site sure deserves The Humanity Award." The Titanicaxx's Tavern Diamond Award was awarded to this site on February 05, 2002. It was bestowed upon us for excellence in website design. "Your site is exceptionally well laid out by the way :) ." 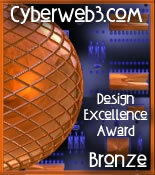 The CyberWeb3.com Design Excellence Award - Bronze was bestowed on this site on February 02, 2002. This award was given for excellence in website design. "We extend our sincerest congratulations to you for the hard work you invested in creating a beautiful web site." The Desert Rose Web Excellence Award was bestowed upon us on February 07, 2002. The award is given for excellence in website design. "After viewing your site I'am pleased to present you with the award." The ASR Top Site Award was bestowed upon this site on February 09, 2002. The award is for excellence in website design. "Your website is considered worthy to carry The Prestigious ASR Total Web Service's Top Site Award. A Great Site, Definitely a Top Site!" Note: This image is not hosted on webmasters server.